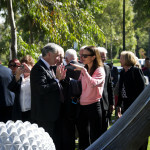 As part of the ANZAC Centenary, the sculpture was officially opened on Monday, April 13, 2015. The ceremony marked the completion of the artwork and provided an opportunity to formally acknowledge the support of everyone who contributed to this significant community project. The ceremony was presided over by Serdar Baycan as the Master of Ceremonies, with key note speakers including the Hon. Daniel Andrews, Premier of Victoria; Senator the Hon Concetta Fierravanti-Wells, Parliamentary Secretary to the Minister for Social Services, representing the Hon. Michael Ronaldson, the Federal Minister for Veterans’ Affairs; His Excellency Mr Reha Keskintepe, the Turkish Ambassador; the Hon. 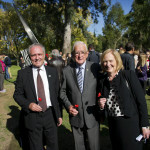 John Eren, the Victorian Minister for Veterans; Major General David McLachlan, AO (Rtd), State President of the RSL; and the Hon. Lord Mayor of Melbourne, Robert Doyle. Brief remarks were also made by the project convenors, Ramazan Altintas and Elizabeth Grigg as well as from the Artist, Matthew Harding. Footage and photos taken from from the opening. Disclaimer: If an image or video used on the website raises concerns please contact the Web Administrator through the Contact Us service.